Great news, aviators! 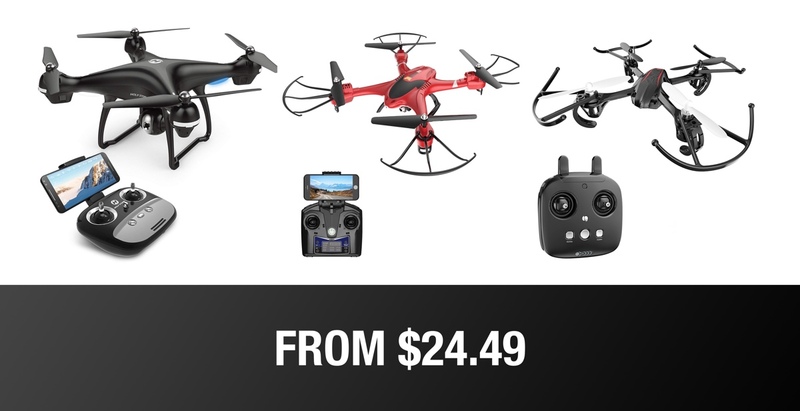 With the set of deals that you are about to feast your very eyes upon, it’s possible to save up to 30% on the purchase of some wonderful Holy Stone drone hardware. Available inn various styles and configurations, there is definitely something to suit all tastes amongst this collection. If you are based in the United Kingdom, or have been attempting to travel from one of the UK’s major London airports in the last four weeks, then you’re probably sick of hearing about drones. After all, they aren’t particularly fun when they are being used to disrupt and shut down travel from one of the world’s busiest airports. However, on the lighter side of life, drones are extremely entertaining and seriously advanced pieces of kit when you consider that you are essentially controlling an airborne gadget complete with high-tech video recording equipment. As mentioned, these Holy Stone drones are available in all different configurations. Some are complete with an onboard 720p camera designed to feedback live video to you a connected smartphone app. Other options are a lot cheaper and include nothing more than the ability to take flight and enjoy the fact that you are in control of an actual vehicle in the air.